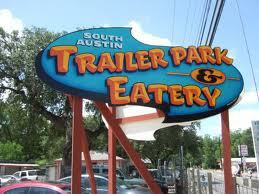 I pulled into South Austin Trailer Park & Eatery around 11:30 a.m. hoping to beat the rush of people I knew would soon be crowded around the three food trailers currently hitched there. I was happy I found a place to park, but before I could switch gears I was surrounded on all sides by hungry customers in their cars, probably sharing the same feelings of gratitude toward the spots they found. Food trailer parks all seem to share the same “style.” They have food trailers (of course), scattered picnic tables with individual umbrellas or occasionally covered by a retro awning and stringed lights strung with great care for special effect. Customers enjoying the sunny afternoon underneath the umbrellas. 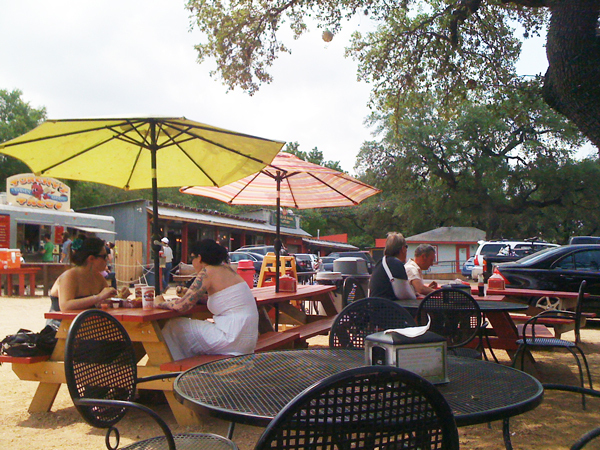 South Austin Trailer Park & Eatery, however, is in a league of its own. In addition to the usual, they provided a pavilion. In this pavilion they provided even more picnic tables, a couch rested against the left wall under a large flat screen and three chairs alongside the right wall with a large coffee table for more comfortable dining. In case this isn’t enough to draw you in, they hung ceiling fans and heaters to ensure you stay at the right temperature while enjoying their tasty treats. Foosball and ping pong are also available for your enjoyment. Nestled in the center of the park are three food trailers; Conscious Cravings, Holy Cacao and Torchy’s Tacos. Noticeably missing on this day, however, was Holy Cacao. Since their frozen hot chocolate is one of my favorites, seeing a huge empty spot between the other two trailers created an empty spot in my heart as well. Caitlin, an employee at Conscious Cravings, quickly insured me it was only temporary. The owner of the food park, Torchy’s Tacos, is the obvious main attraction. The swarms of people flooding into the parking lot all quickly migrated to the fast-moving line at their trailer. Equipped with a much larger staff than the other two trailers, who generally house just one employee, tacos are made before you have the time to realize you’ve been waiting. Quite impressive for the number of people inside the trailer. Eric, a frequenter of the eatery for the past couple of months, enjoys the taco of the month, Ace of Spades. An 8” tortilla stuffed with a jalapeño sausage link and smoked brisket, then topped with a fried egg, shredded cheese, Green Chile Queso, cilantro, queso fresco, sour cream and DIABLO HOT SAUCE. His one complaint? “They don’t have it all the time,” he says. With a passion for good food, Michael Rypka decided to leave his job as an executive to pursue his dreams. He decided to begin his venture in Austin with a new food trailer and a Vespa scooter and opened the first Torchy’s Tacos on Bouldin Creek at South 1st. 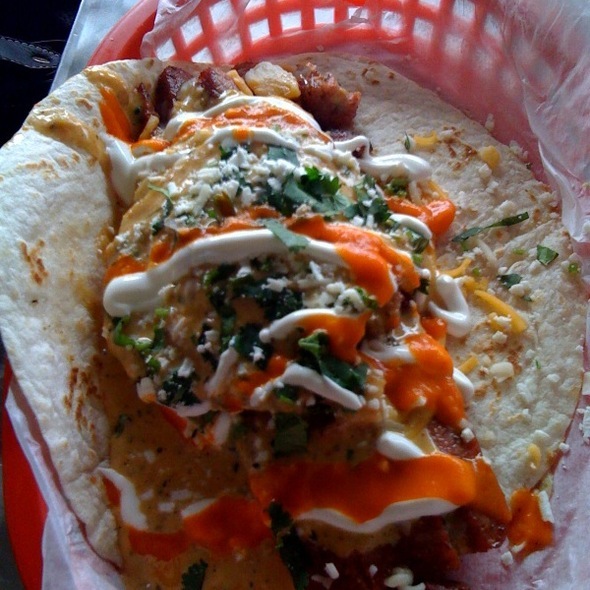 The love for Torchy’s Tacos began after Mike himself passed out his award-winning chips & salsa to soon-to-be customers on his scooter. It spread like wild fire and they now have fifteen locations in four cities, with three more locations coming soon. With a completely different menu, Holy Cacao brings dessert to the table. 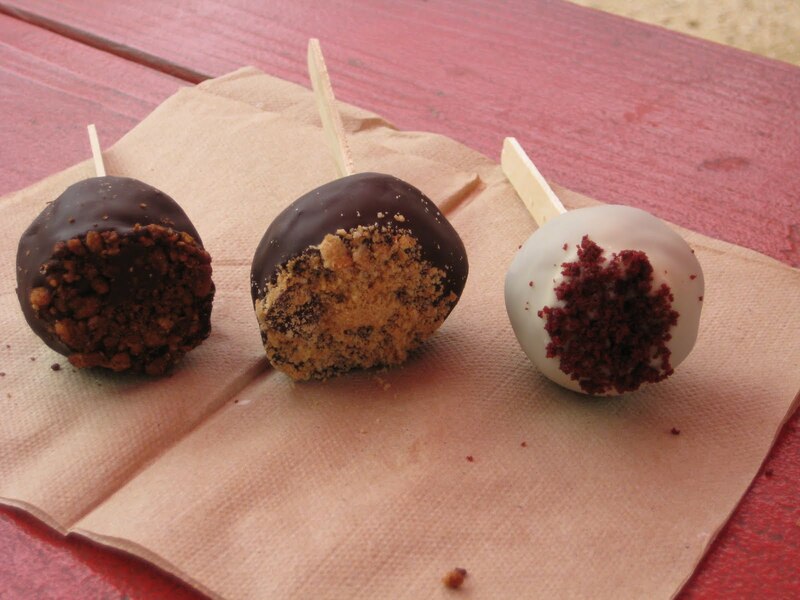 They advertise having “The Best Cake Balls” and “are perhaps the first to place them atop a popcicle stick and serve them from a trailer,” according to their website. 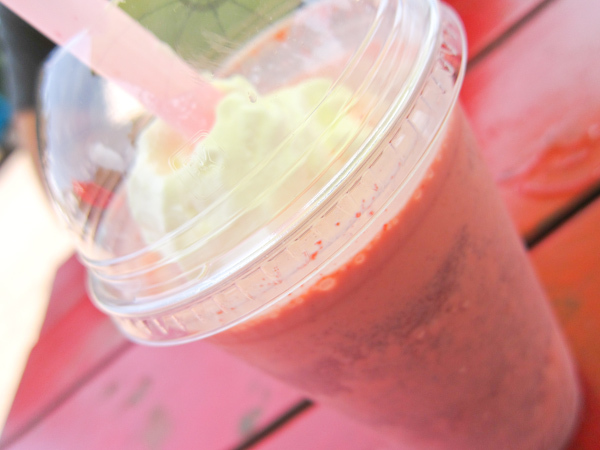 With items ranging from cake balls to cake shakes, floats to hot chocolate, they satisfy the need for every sweet tooth. “Holy Cacao is a chocolate lover’s heaven. I don’t do sweets often but the assortment on the menu is amazing. The selection of cake balls is insane,” says Khiem, a food hobbyist. (from lefts to right) Diablo-Chocolate cake with ancho/cayenne cream cheese frosting, dark chocolate and cayenne and cocoa toasted walnuts; Brass-Peanut butter cookies with chunky peanut butter, dark chocolate and cookie crumbs; Velvet cake balls-Red velvet cake with cream cheese frosting, white chocolate and toasted cake crumbs. Prices vary. Those after something on the lighter side can order from the newest addition to the park, Conscious Cravings. It joined the group in mid-November and offers an array of local, organic, gluten-free options. With the menu to back it up, their mission is enough to convert anyone to vegetarianism. 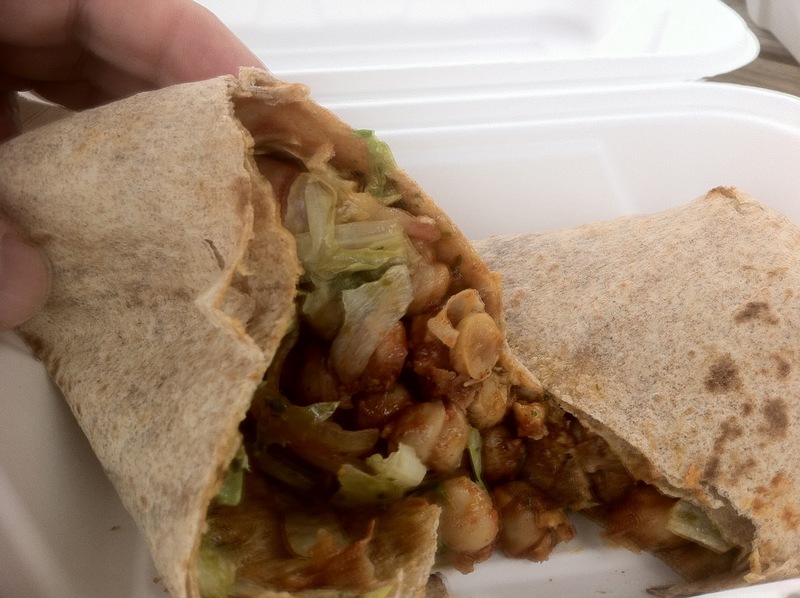 The best seller is the Spicy Chickpea Wrap. Tender chickpeas simmered in Indian spices, snuggled on a bed of lettuce, onion and tomatoes and wrapped with a scrumptious green sauce. Tied for first place, Caitlin says, are their baked french fries with rosemary and thyme. Mmmm. Caitlin, who has been with them since they opened, prefers working in a food trailer because “it isn’t as crazy as working in a restaurant. There’s less space to deal with,” she says. She does admit, however, that working in such a tight space can become challenging. The food trailer fad is in full swing in Austin and showing no signs of slowing down anytime soon. Mobile eateries have been hitching up all over Austin and now total over 1,600. Even with such a variety, it’s hard to imagine any to have as great of service and ambience as South Austin Trailer Park & Eatery. According to the general consensus, the atmosphere just keeps bringing people back. Austin Food Trailers is dedicated to finding as many mobile food eateries in the area as possible. I have a passion for food and want to share my findings with fellow food hobbyists who enjoy food and the recent trend of food trailers just as much as I do!